first of all, wow. you girls came out and played this give-away like it was you business! wahoo and yay for molly blossom!! however, there can only be 2 actual winners. but remember...we are all winners. hehe. okay - here we go, drum-roll please. winner of the custom ear buds is comment #9 tbl182004, who wrote, "The Molly Bag and Blossom Padded Stripey Tote are my favorites!!!! Everything is gorgeous!!!" winner of the custom sadie is comment #54 jamie, who wrote, "Love the Molly bag. There isn't a bag out there that cute that would work for a Mom of three. LOVE!!" thank you random.org for once again picking the winners. thanks again for all your support for Molly Blossom, i love that you help support other stay at home mommies that have talents! that makes me smile! keeping it real. :) i think her etsy store has been hopping, as it should! i got my hands on a pair of the ear buds and feel head over heels! and just a side note...i have been getting lots of emails lately asking about status of when i may be making more orders and such. i am still on maternity leave and my sweet little one will be 2 weeks on wednesday! my sewing room has NEVER had this long of a break, and i have never been able to turn off the creative mind for this long either! i am enjoying every minute of my sweet little boy and fire-ball louisa and will get back to orders and creating when the time is right. :) have no worries...my amazing BG fans will be the first to know! Okay….got some really exciting news. 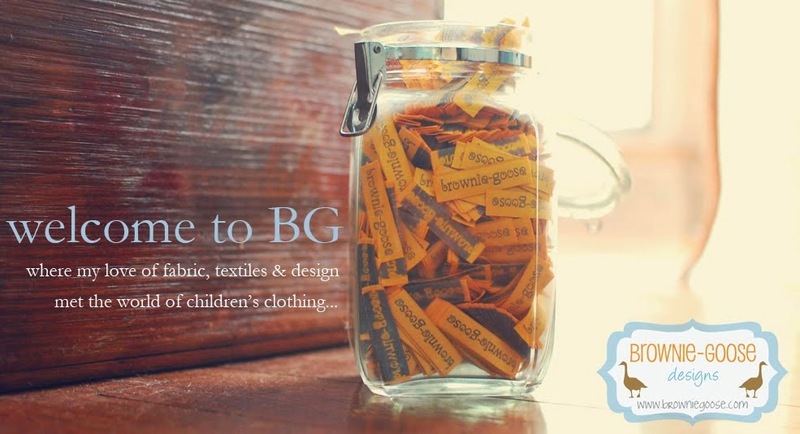 BG is hosting its very FIRST give-away!!! I don’t know about you, but I certainly love a give-away. And more than anything, I love supporting a fellow stay at home Mom with super-skills at the machines. This give-away is for the fabulous-ness of Molly Blossom. If you love yummy fabrics, feminine styles and a little bit of vintage charm…you will EAT this stuff up! So, meet the artist behind the fabulous Molly Blossom. We became friends as our husbands both work at the hospital here in town. We are both Georgia girls – so that got her an extra boost in the coolness. Hehe. She never ceases to amaze me with her talent at the machines. We became sewing buddies swapping ideas and I told her she is the master of re-purposing. Seriously, there isn’t much this girl cannot do. She has had NO formal sewing lessons, which blows the pants off of me – she knows her stuff. She started off sewing clothes for her little girls, then played around with some patterns of her own (this is where she is the master of re-purposing…seriously jeal of this talent) and then one day started a bag. Then, she found her love. Hand-sewn bags out of the yummiest fabrics you can find. She has them all, clutches, larger bags, cosmetic bags, you NAME it! Her etsy store is jam-full of them. She recently started selling her bags in January and just opened Etsy shop. I have a feeling she is about to get uber-busy! :) Her style is so fine and she finds inspirations from Anthropologie (anyone else drooling? ), Fossil bags and the brilliance of Amy Butler and her fabrics and patterns. She has an eye for bringing color and design together to create a bag that if carried, will certainly have some swooners. Now for what you are all here for….the GIVE-AWAY!!! What’s up for grabs? Oh, you just wait. 1. First on the blocks are a pair of her Ear Buds, which in my opinion are a MUST have. I saw them on her last night and it was all I could do not to take them off her ears. They are fabulous. 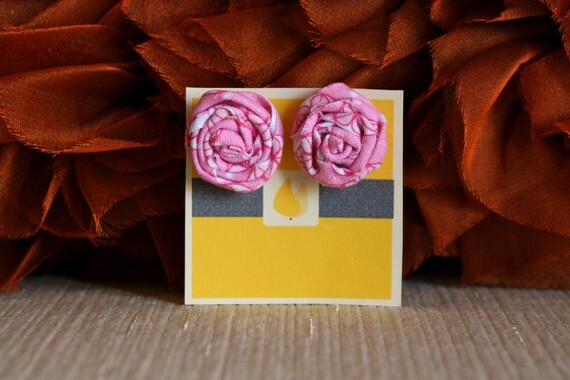 She will CUSTOM-MAKE these for the winner out of her fabric stash. This is a big deal, as she doesn’t usually do custom work. You don’t want to miss out on these Ear Buds! 2. Second up is a Sadie Clutch. This clutch makes me smile. It is adorable and you will NEED it. She will also custom-make this to the winner’s choice of her fabric stash, which again…is not something she usually does. For real, I don’t know about you – but you don’t want to miss out! I drool over those Ear Buds and the Sadie! Comment below with your favorite item in her Etsy Store. Which item speaks to you and makes you swoon? It may be hard to pick just one!! I will be hosting the give-away for 48 hours…so, make sure you comment before Sunday the 26th at noon (central time). Then, I will grab my old friend random.org and pick 2 winners. Oh this is the most fun!! Don’t delay!!! Tell me you fave and keep your fingers crossed while talking to lady luck! 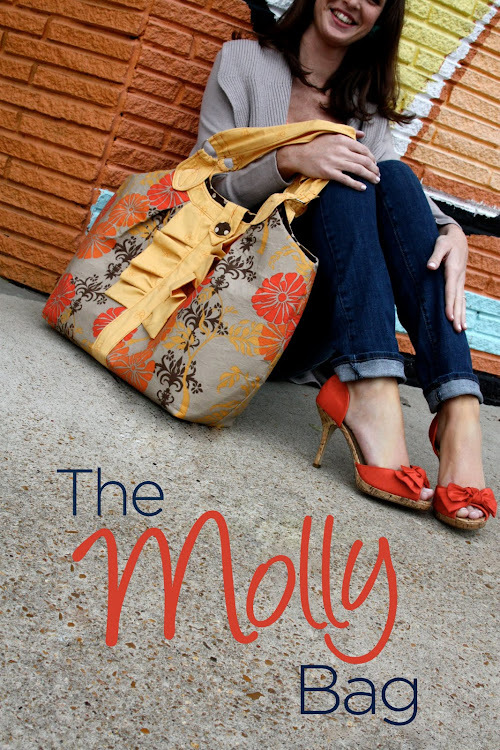 Just to make it the more fun, Molly Blossom is also hosting a give-away on her Facebook page. When she reaches 60 friends…one of the fantastic pairs of Ear Buds will be given away there as well. Eeeeek! now, just need this baby to come on out! thanks for all the awesome support and i will be back soon with more designs once i figure out life with 2 kiddos! absolutely, head over heels in love smitten. oh dear me. there are some times in my sewing room when i get into one of my phases and start working and cuss through pattern design and fits and getting things to work just right. i go through tons of broadcloth until i get it just right, my floor is littered with tracing paper of measurements and patterns that just didn't work. and then it happens. it all comes together. and i swoon. this dress has hands-down been my biggest love in a while. the lily rufflers came close, but this dress makes my heart melt. i love her. i envisioned her one day when i bought the small blue buttons that close it in the back, and i waited until the right fabrics fell in my lap. and heather bailey...you win. i knew i would find a use for the vintage-inspired nicey jane soon. she will be for sale at some point on etsy - i just don't know if i can get rid of her or not. this original may stay for my louisa, but i do need to make more. that flutter sleeve calls me in. it asks me to make more sizes to perfect the pattern. maybe even pull out some old vintage prints (if i can find them in my second sewing closet) of dreamy florals.